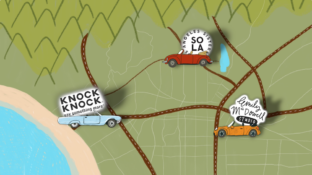 Win Books for Dad and Knock Knock Stuff for Father's Day! 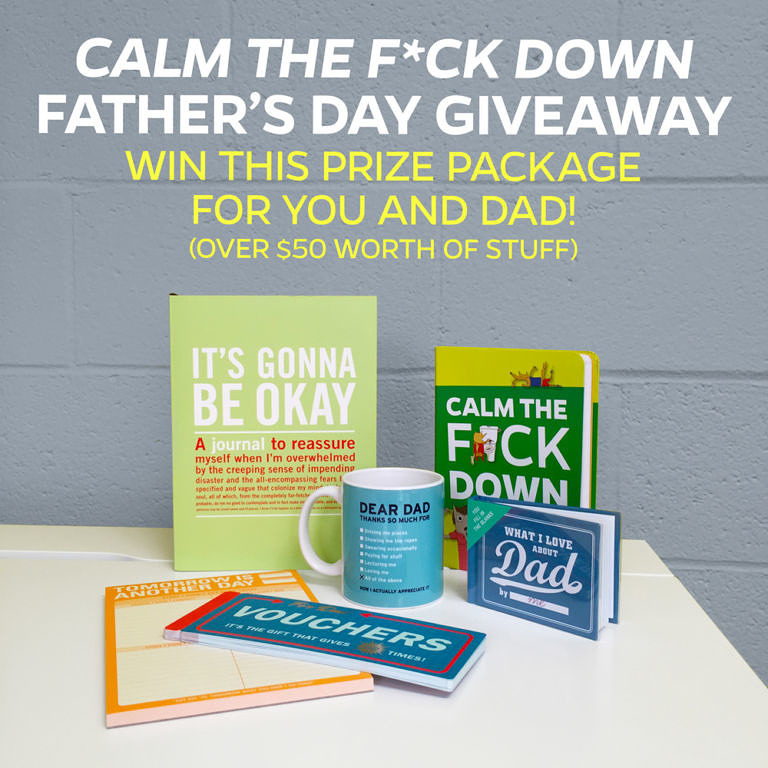 Win a Copy of “Calm the F*ck Down” + $50 Worth of Father’s Day Prizes! Knock Knock Stuff for You and Dad! Father’s Day is coming up this weekend (Sunday, June 21! ), so we’re giving away a special prize pack in honor of one of Knock Knock’s favorite dads, David Vienna, author of Calm the F*ck Down: The Only Parenting Technique You’ll Ever Need and The Daddy Complex. His book (alongside other items listed below) is a great gift for new and expecting dads all year long. His wise and funny parenting advice reminds you that (almost) nothing is worth freaking out about. Don’t worry, you don’t have to be a Dad to enter this giveaway. You don’t even have to share your winnings with Dad (but that would be nice). How to enter: Use the Rafflecopter form below to complete your entry. See below for all entry methods, including sharing your “CTFD” parenting moment in a blog comment. We’ll contact winners by email. The giveaway closes Sunday, June 21 at 11:59 p.m. Read official rules here. Another way to celebrate Father’s Day: share David’s “Discussing News with My Kids” vids with your Dad for a great laugh. Don’t forget to sign up for our newsletter and check our Facebook, Twitter, Pinterest, and Instagram pages to see what we’ve got going on. Great gifts for dads. Thanks! Right now! I’ve got 6 medical appointments in 7 days prior to surgery with 2 young kids in tow. I need to CTFD in order to get through this! Entering to win this for my husband – a brand new foster dad! My 1-year-old kept shouting and walking off toward his 9-year-old sister’s room, then turning around to look at us and yell some more. After a while he started to giggle and we realized he was copying her angry tantrums. Yikes! My wife and I have the two best-behaved, brilliant, beautiful boys, but not a day goes by without a CTFD moment. Lately, that moment is tied to their obsessive use of their iPod touches to play MineCraft. “Time for lunch,” I’ll say. “Come to the kitchen table.” … Silence. … “Boys? Lunch.” … Crickets. … Down the hall I’ll stride, knowing what I’ll find: two little heads huddled together over two iPods, fingers furiously flying across the screens. They’re building a world together, and there is no time for lunch. But: “Dudes. Put down the MineCraft and get to the table! It’s time to eat!” … After a beat, without looking up: “I’m not hungry.” Oh, man. After the fifth or sixth round of this, the little Vienna on my shoulder whispers, “CTFD, Carter. C.T.F.D.” And I do. Every day has a CTFD moment or sixty in my house with a six year old instigator and a none year old with little patience for his sister. I am entering to win a gift for my dad! I was once babysitting three kids, the youngest boy had taken the oldest girl’s iPod (which to her was the best thing ever to own) and started running with it. I ran into his room and I saw him jump onto his bed and look me straight in the eye and drop it between the side of the bed and the wall. This bed could NOT be moved, mind you. I was so furious, and all day these kids had been pushing my buttons. While I was attempting to reach for the iPod i heard one of the girls getting mad in the kitchen, I left the iPod and walked in on her trying to turn the gas stove on, neither of them are old enough to cook. She turned the gas on but she never lit it, so the whole kitchen smelled like gas . . .
“Well, no one died” is the positive saying I always say when I get in my car at the end of the day! I can’t think of just one right now, there are so many. I feel like life with my 5 and 6 year old boys is a constant replay of CTFD moments… It’s a blast. I remember walking in to the kitchen to find flour EVERYWHERE! My son wanted to cook me something, and figured that flour was a start..until it fell of the counter. Really too many moments to pick just one after raising two kids…but I’d say coming home from night class and finding dad had allowed “arts and crafts” time on the sofa–magic markers and all–well, CTFD was a good mantra at that moment. By the way, the red marker never came out. I think I need to remember this when I am sleep deprived and getting woke up in the middle of the night. I get SO grouchy but then I remember to CTFD! Lol. Too many moments to list but the ones that come to mind all revolve around safety and bodily function stuff! My CTFD moment would be two screaming hungry children, while trying to get home after a long day! Thanks for the chance!